Clay is not the usual material associated with luxurious car showrooms but counter balancing modern technology and metal with raw earth materials is a brilliant design concept by Vonsung, for Mercedes in Hong Kong. 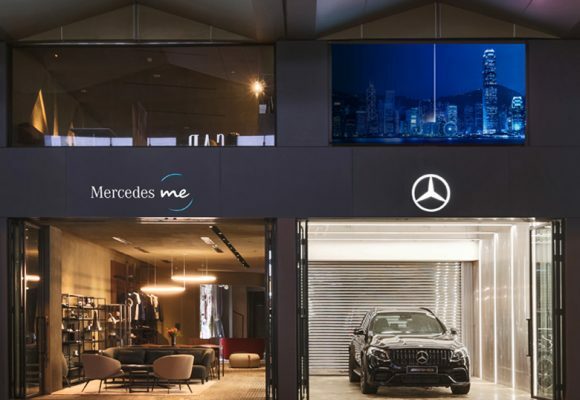 … the design concept of the brand-new Mercedes me Store is ‘Hau’, which means ‘Home’. From the entrance living room and the in-store boutique retail area to the lounges inside of the store, you will navigate through a comfortable and familiar space that feels like home. Our garage will be showcasing the latest models, classic or concept cars to spark your inspiration. The importance of materials and texture as a trigger to creating an environment where we can physically and psychologically relax is becoming a topic of significant relevance in the retail and hospitality sectors and is particularly important in hectic cities where the lines between lifestyle, eating and retail are increasingly blurred. 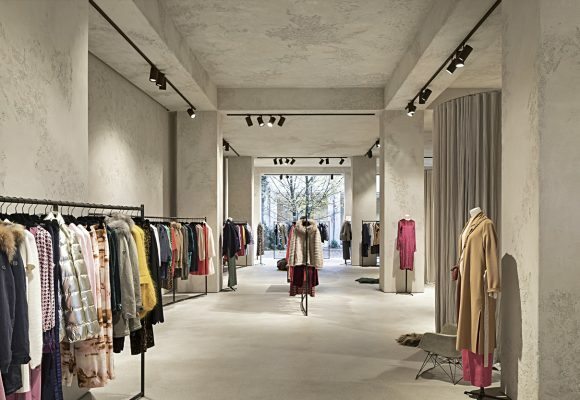 Clay Plasters, with their soft textures, breathability, tonal variation and aesthetic possibilities have increasingly been specified for new retail concepts around the world, but as far as we know, this is a unique and trailblazing concept for a car showroom. 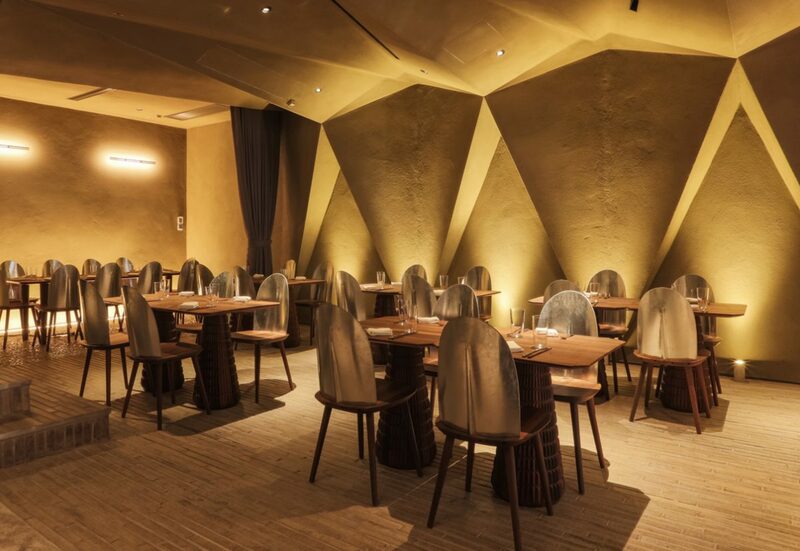 The unique, earthy patinas and various textures of clay plasters need no decoration, and the restaurant design is a masterful demonstration of how to awaken the senses and evoke a unique, emotional connection to a building, using only one material. Lighting and original design complete the effect, provoking a moody and sensual relationship with light and shadow. Because clay does not go through a chemical reaction when it ‘sets’ it will hold intricate textures and sculptural shapes leading to striking visual effects and drama with light, contrast, strong colours and texture. This is what differentiates it from other plasters, which generally contain gypsum or lime. Hence clay plasters can be true storytelling materials, not only eloquent, sublime and subtle, but also exciting and impactful, multi-layered, eccentric, non-conformist and rebellious. Sculptures, carvings and even Sgraffito, a technique of applying layers of unfired clay plasters pigmented in contrasting colours, to a wall surface and then scratching it so as to reveal parts of the underlying layer. While clay differs from other plasters aesthetically, they perform very differently in other ways. 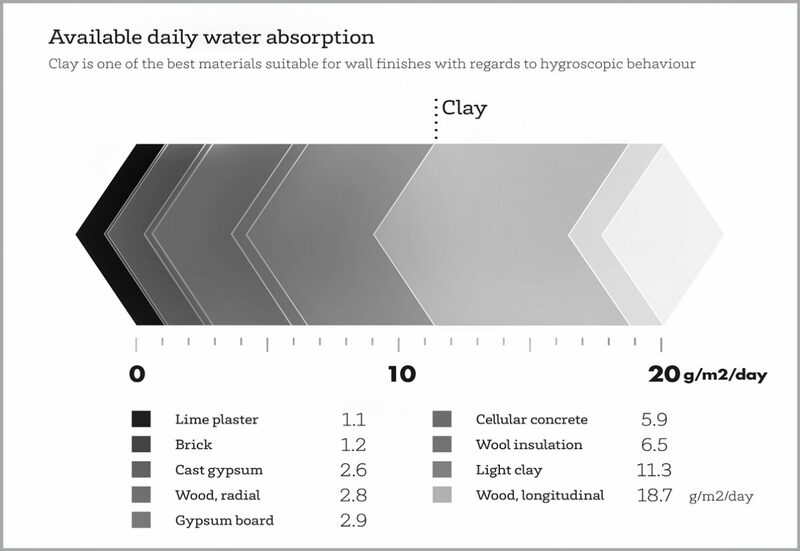 Clay plasters’ thirst for moisture means they can safely absorb and hold moisture vapour within their molecular structure when relative humidity levels are high and then release it back into the atmosphere when relative humidity levels drop. This ‘breathability’ helps to regulate moisture at a temperature recommended for optimum indoor healthy air quality. Again, this is a consequence of the fact that clay plasters dry rather than set, and remain as a raw material, meaning that they are one of the most breathable options for interior finishes. It also means that they are not suitable for exterior use, where lime based plasters can be a preferable option. Ozone is a pollutant with known detrimental health effects such as respiratory illness, asthma etc. The by-products of the reactions that ozone has with many indoor products, including furniture, carpets, cleaning fluids and electromagnetic equipment, can also be irritating or harmful. The addition of clay plaster when carpet and ozone were present result in significant improved indoor air quality and lower formaldehyde concentrations. Largely unregulated, noxious chemicals and substances are emitted by so many architectural and interior products. They are benign in appearance. Clay plasters have no synthetic additions, no VOCs and no off-gassing. – just earth and natural minerals for colour. They are flexible materials that absorb and dampen sound, while absorbing rather than reflecting light. For more pictures please visit our gallery feature.